I am one of those types of people that would make a batch of cookies just to eat the dough and not actually bake it. Because the dough is my favorite part! Usually when I make cookies, I do eat more dough than the baked cookies (I share them), just because there is just something irresistible to me about the texture and flavor of it that is better than the baked cookies. When I was a kid in my Grandma's kitchen, I was always stealing dough. She would tell me not to eat too much, or I would get a tummy ache, but I never got one. I love the dough just as much now, and of course it is vegan dough so no dealing with that raw egg stuff. 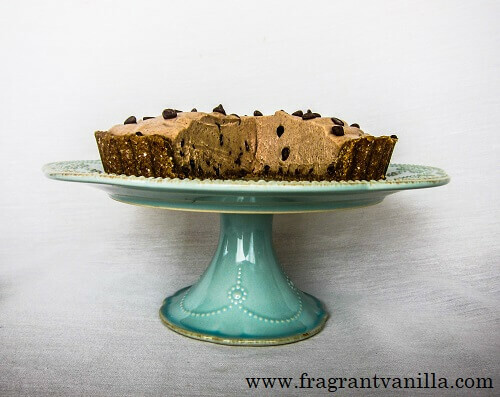 I have even made a few cookie dough desserts (besides actual real dough), like my Vegan Chocolate Chip Cookie Dough Cake , Vegan Chocolate Chip Cookie Dough Truffles, Vegan Cookie Dough Ice Cream, and Vegan Cookie Dough Popcorn, and they were all amazing. But I hadn't made a pie yet. The idea was in my head, I thought about making one a while back, but it got pushed to the back burner. My brain is like a snowstorm of different ideas sometimes, with the snowflakes being ideas, so something has to wait to be made since I can't make them all at once. 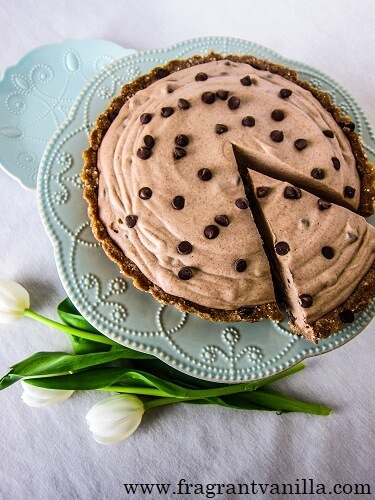 Well, it sounded really good to me last weekend so I finally made a chocolate chip cookie dough pie! I was super excited. I had all of the ingredients on hand, which is always a plus. I love it when I don't have to buy anything extra. I decided to make this gluten free and nut free as well, since I know a lot of you will appreciate that. For the crust, I usually use oats, but I wanted to try quinoa flakes as a completely gluten free option. It worked perfect! They blend up more fine than the oats, and are pretty neutral in flavor. If you prefer oats though and don't mind it not being gluten free, you can feel free to use them if you can't get the quinoa flakes. 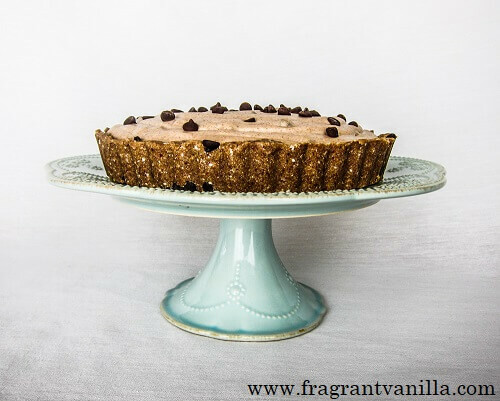 I blended them with dates and a few other things to make a sort of cookie dough crust and it was the perfect base for my cookie dough filling! The filling has a somewhat unusual dessert ingredient, chickpeas. I like to use them in things like this because they are neutral in flavor, and work like nuts in a recipe like this. I wanted to keep it nut free, so they are a perfect substitute for cashews. I also added coconut milk, as the bulk of the filling to give it a creamy luscious texture like a cookie dough mousse. I added in a little vanilla and it was perfect! It did taste like cookie dough mousse. I could have eaten it with a spoon like that, but a pie is prettier and even better with the crust. 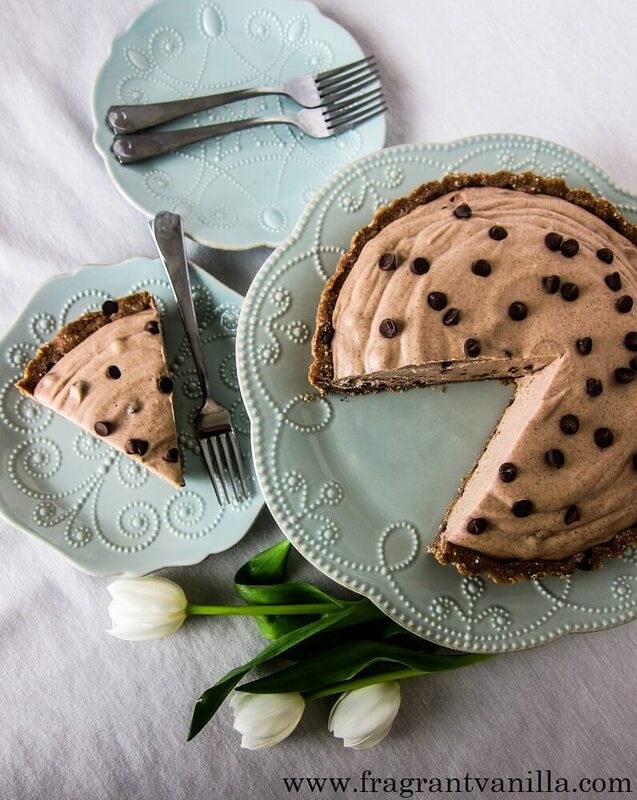 This is a cookie dough lover's dream! If you agree that cookie dough is better than actual baked cookies most of the time, give this pie a try! 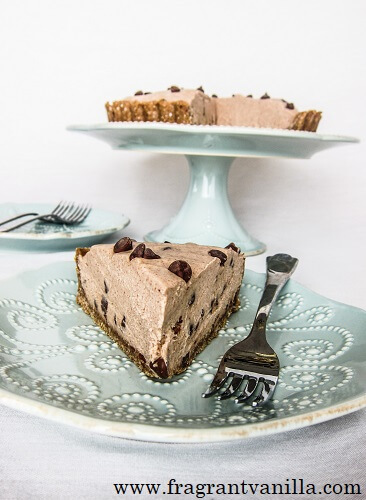 For the crust, combine all ingredients but the chocolate chips in the food processor until finely chopped and starting to hold together when squeezed. Mix in the chocolate chips by hand. Press the mixture into an 8 inch removable bottom tart pan greased with avocado oil (or other oil that doesn't harden when chilled). For the filling, combine all ingredients but the coconut butter and chocolate chips in a high speed blender and blend until smooth. Pour in the coconut butter and blend until smooth. Stir in the chocolate chips. 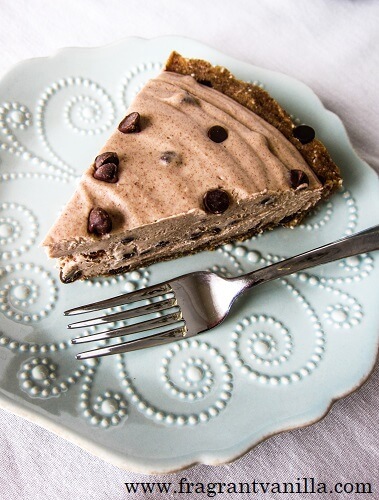 Pour the filling over the crust, and sprinkle with more chocolate chips. How long will it last in the freezer. Planning to send it to my son’s school just in case they serve cupcakes or cakes for birrhday parties. Thanks! It should last a few months in the freezer as long as it is in an airtight container.